If you have been camping before, you know just how important it is to have a good sleeping pad. Losing a night’s rest because of an uncomfortable sleeping pad can end up ruining your camping vacation. Just because you are camping doesn’t mean you have to sacrifice all of your comforts. When you get a good-quality sleeping pad, you can sleep just as good as you would in your bed at home. Sleeping pads not only provide you with a comfortable surface to sleep on but also serve as an insulator to trap your body heat and keep you warm in cold weather. In this article we will discuss the different types of sleeping pads, the top 10 best sleeping pads, and all of the things you need to know before choosing the best one for you. This lightweight sleeping pad is a great affordable option. The V-shaped cambers limit air movement and heat loss, keeping you more comfortable. The inflated side rails keep you on the pad if you move around in your sleep. They also contribute to insulation. The Static V pad can be inflated with just 10-15 breaths. When you want to deflate it, just use the push valve to quickly release the air. Made of 75D polyester fabric, this air pad is durable. In case of punctures, it comes with its own patch kit. It rolls up easily and fits in the included stuff sack. Its pack size is just 3-inches by 8-inches, making it easy to fit in with your other camping gear. 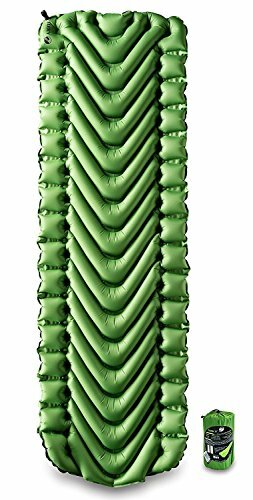 Featuring jet stream polyurethane foam, this self inflating pad inflates and deflates easily and quickly. To deflate, simply roll up the pad to push out the air and close the valve. The fabric on the top is made of Diamond Ripstop and the bottom is made of polyester taffeta. This combination makes for a durable and abrasion resistant sleeping pad. The bottom also has anti-slip dots so that the pad doesn’t slide around underneath you on your tent floor. The valve is made of non-corrosive brass. This sleeping pad is very durable but also lightweight and easy to take along with you for your camping trips. A repair kit is included in case you ever get a puncture in the sleeping pad. 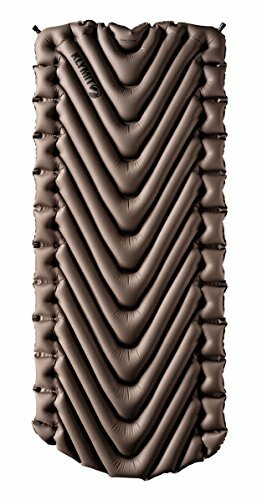 The brushed suede-like top of this self-inflating sleeping pad makes it softer and more comfortable. It also prevents you from sliding around on it. The jet stream wave foam takes about 3 minutes to inflate. Simply open the valve and sit back and wait for it to inflate fully- no work required. When you want to store it away, simply open the valve and roll up the pad to push out the air. Tighten the valve and put the pad in its carrying case. The bottom fabric has non-slip dots so that the pad does not slide around while you sleep. The material of the fabrics is strong and durable. A non-corrosive valve adds to the durability of the sleeping pad. Featuring open-cell polyurethane foam, this pad will retain its shape no matter how many times you roll it up. This TETON Sports Camp pad comes in 3 different sizes to fit your individual preferences. The Adventurer Sports Camp Pad is 2-inches thick and features a removable shell and pockets. The removable shell is a great feature since it makes it very easy to wash. The pillow pocket is a great place to store your pillow without having to worry about it sliding off the pad when you toss and turn during the night. The built-in carry handle and tie-downs make it easy to secure to a cot. You can also use the pad on the ground. This pad is durable and comes with a lifetime guarantee. The built-in roller assister helps you to roll up the pad tightly for storage. Featuring a ridge and valley construction, this closed-cell foam pad is designed to trap warm air underneath your sleeping bag while you are sleeping, providing excellent insulation. The aluminized surface reflects body heat to keep you warm and comfortable. The soft peaks make this pad more comfortable. This sleeping pad is ultra light and pretty much indestructible, making it the perfect backpacking sleeping pad. It is great 3-season pad for backpackers that may have to sleep on snow. 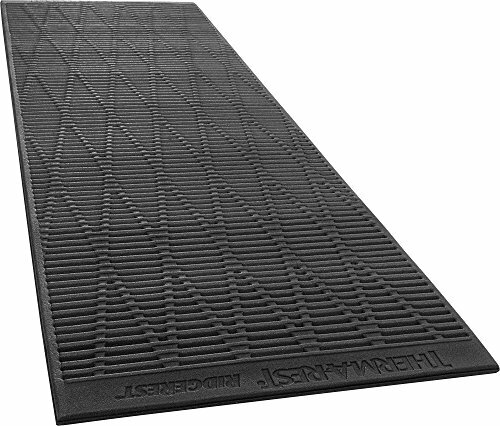 This durable pad is a great budget-friendly option without sacrificing quality. You can inflate this air pad with just 10-15 breaths. The V-shaped chambers limit heat loss and air movement. When you want to deflate it, simply use the push valve to quickly release the air. This pad is lightweight and perfect for 4-season use. The ThermaCapture surface of the ridged surface reflects heat, keeping you warm. The closed-cell design makes this pad very durable, virtually indestructible. 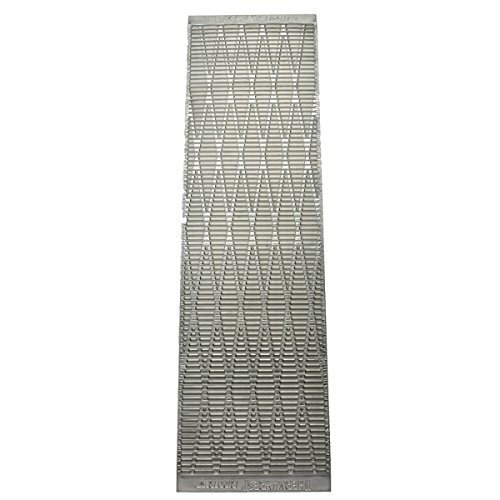 When packed, the peaks and valleys nest inside each other, saving space by making it more compact. Featuring Body Mapping Technology, the V-shaped design offers great support and comfort no matter your sleeping style. This pad is extra wide for comfort but also super lightweight. It has an exceptionally compact packing size and an included storage bag. This self-inflating pad has an attached pillow for added comfort and convenience. The nylon shell is weather-resistant and durable. It features a tufted design to provide extra cushion and comfort. To provide extra support, this closed-foam pad has peaks and valleys which also trap heat to keep you warmer. This is a great budget-friendly option for campers who want a basic sleeping pad. Since choosing the right sleeping pad can make or break a good night’s rest, it’s important to learn a little more about them to ensure that you choose the best one for you. Here are some important things to keep in mind before purchasing a sleeping pad. As already discussed, there are 4 types of sleeping pads: air pads, self-inflating pads, closed-cell foam pads, and open-cell foam pads. To help you decide which type to buy, think about what kind of camping you will be doing. For backpacking, air pads or lightweight self-inflating pads are best. After a long day of hiking, you may want to just collapse, so choose a pad that won’t take long to set up. For minimalists backpackers, ultra-light air pads work well. For thru-hiking, low weight is of the upmost importance. Closed-cell foam pads work well for this. If you will be car camping, weight and size is usually not an issue, so you can opt for the sleeping pads with the most cushion for the most comfort. Open-cell foam pads and self-inflating are good and you can get a larger size without it causing an issue. For winter camping, insulation is key. Air pads that offer good insulation are a good option. 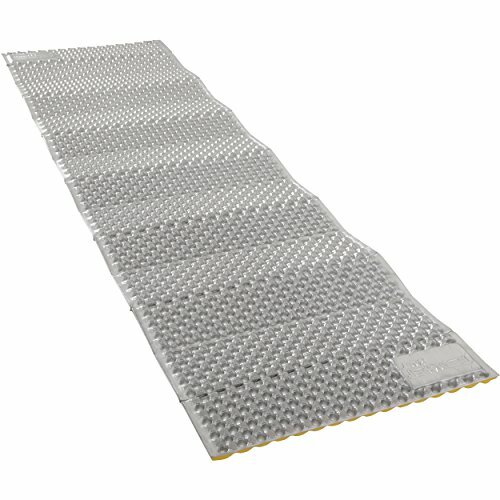 You can also use a self-inflating pad on top of a closed-cell foam pad for excellent insulation. This is especially important for backpackers to keep in mind. A few extra pounds may not sound like it would make much of a difference, but when you are backpacking and carrying your gear for hours, a few extra pounds can slow you down considerably. At the same time, sacrificing weight when it comes to sleeping pads often means sacrificing some comfort and warmth. So decide what will work best for you. Even a lightweight sleeping pad can sometimes be bulky, so keep this in mind especially if you will be backpacking. Closed-cell foam pads do not compress as much as air pads but are very durable and can be carried on the outside of your pack without being damaged. Of course, the smaller the packing size, the less cushion, and comfort a sleeping pad offers. This is important to pay attention to since you want to make sure that the pad is big enough to fit under your whole body. This will ensure you are properly insulated on chilly nights. Regular sized pads are usually 72 inches long (6-feet). So if you are taller, go for a longer pad. Regular length sleeping pads are usually 20 inches in width. If you move around a lot in your sleep or you are a larger person, go for a pad that is 25-30 inches in width. At the same time, make sure there will be enough space in your tent for a bigger pad. When camping in cold weather, a sleeping pad that efficiently insulates heat and keeps you warm is of upmost importance. A pad will work with a good sleeping bag to keep you warm. But often a pad can make the difference between you freezing at night or sleeping comfortably. The best pad for you will largely depend on what surfaces you will be sleeping on and what kind of shelter you will use. For example, the interior of a double-walled tent will be much warmer than inside an ultralight shelter. So if your shelter won’t insulate much heat, you will need to compensate by getting a pad that insulates heat well. If you will be camping in cold weather often, you need to pay attention to the R-value of the sleeping pad. The R-value tells you how well the pad resists the flow of heat. The higher the R-value, the better the insulation will be. For campers that will often be camping in freezing temperatures, a pad with a R-value of at least 4 will keep you warm. Usually, thicker pads have a higher R-value. As mentioned previously, you can also use a combination of 2 pads to keep you warm in cold temps. Of course, self-inflating sleeping pads are some of the easiest to set up. All you do is open the valve and sit back and relax while the pad inflates by itself. If you choose an air pad, check how many breaths it will take to inflate it. If you prefer less work, you can bring along a hand pump to do the work for you. Nothing is more annoying than sleeping on an air pad that has lost too much air. To combat this, some air pads have separate inflation chambers so that if one gives out, you still will have some cushion. Many air pads have V-shaped chambers to restrict air flow as well as heat loss. If you move around a lot in your sleep, a sleeping pad that is raised on the sides will keep you from sliding off the pad. These are also great for children. If you don’t want to bring along an extra pillow, some sleeping pads come with a built-in pillow. As far as pillows go, some pads have a pocket to put your pillow in. This prevents the pillow from moving around or sliding off completely while you sleep. Hand pump: After a long day of hiking, you may not have the energy to inflate your air pad using your breath. To make it easier, purchase a hand pump to inflate the air pad. Some air pads come with a hand pump. If yours doesn’t, buy one that will be easily portable. Patch kit: Even a good quality sleeping pad can be subject to punctures or rips. You do not want to be stuck with a deflated sleeping pad on your camping trip. Many sleeping pads come with a patch kit. If yours doesn’t, buy your own. Before choosing a sleeping pad, you should decide which type will work best for you. There are 3 basic types of sleeping pads. Ideal for backpacking, air pads are lightweight and have a compact packing size. You have to inflate them using your breath or a hand pump, so they can take some effort to inflate. Most air pads provide some insulation to keep you warmer on chilly nights. Air pads designed for 4-season use provide the maximum insulation. Most air pads are designed for use in warm weather. You can customize the air pad according to how firm you want it. For maximum firmness, inflate it completely. For a bit softer firmness, release some air out of it. Air pads can have a bouncy feel, which some campers don’t like. When air pads are inflated, they are generally around 2 inches thick. This provides sufficient cushion between you and the ground so that you do not feel the lumpy ground underneath. Air pads are very comfortable and a popular choice for most campers. Self-inflating sleeping pads are made of open-cell foam which is placed between two pieces of fabric. When you open the valve, air fills the pad automatically, expanding the foam. Since the foam in self-inflating pads retains heat, they offer great insulation, keeping you warmer at night. They are usually cheaper than air pads. Of course, a huge advantage is that they inflate without much effort on your part, making setup a breeze. Because of the foam, they are not as compact when packed and are also heavier than air pads. This makes them best for general camping, and not for backpacking. Although there are some self-inflating pads designed specifically for backpackers. Self-inflating pads are comfortable, and like air pads, you can adjust the firmness by releasing or adding air. Closed-cell foam pads are the most simple and inexpensive type of sleeping pad. They are made of dense foam with small, closed cells of air. They are quite durable and you can carry them on the outside of your pack without having to worry about them getting damaged. Closed-cell foam pads are very light-weight and easy to carry. The closed-cell foam construction provides excellent insulation. Although because they are usually only about a half of an inch thick, they aren’t as comfortable as air pads and self-inflating pads. You may feel any lumps in the ground beneath you when you sleep on a closed-cell foam pad. 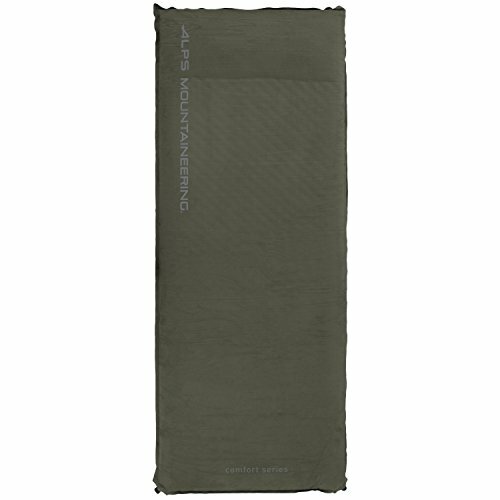 This type of sleeping pad is stiff so it does not have a compact packing size like the other types. This makes them more bulky to carry. However, if you just want a cheap, simple sleeping pad, you might like a closed-cell foam pad. Open-cell foam pads are also lightweight and inexpensive. They are thicker than closed-cell foam pads and are more comfortable. Klymit manufactures some of the best sleeping pads on the market. Klymit is committed to developing innovative technologies to enhance their customers’ outdoor experiences. Their aim is to make products that will keep their customers as comfortable as possible while enjoying the outdoors. They use body mapping technology and loft pockets to make your camping experience more comfortable. They produce some of the lightest and compact sleeping pads on the market. Their sleeping pads are excellent at insulating heat, are durable, and easy to setup. ALPS Mountaineering was founded in 1993 with the aim to manufacture high-quality, durable products without high price tags so that many people can benefit from their products. ALPS Mountaineering produces a wide range of high-quality outdoor gear. Therm-a-Rest was founded in the early 70’s with the goal of making a camper’s sleeping experience more comfortable. They realize that “the better you rest, the better you play”. This means having the most comfortable gear to ensure that you get a good night’s rest. ​Throughout the years Therm-a-Rest has continued to develop innovative technologies to help you get the most out of your outdoor experiences. Their self-inflating air mattress was voted as one of the five best outdoor inventions of all time by readers of Backpacker’s Magazine. ​In 2009, Therm-a-Rest came out with the NeoAir® insulated air mattress which delivers more warmth than other air mattresses. It has won dozens of awards for its efficiency in keeping campers warm. ALPS Mountaineering takes customer feedback seriously and uses their ideas to improve their products. To accommodate for needs of different kinds of campers, they have come out with a line of different ALPS brands. Getting a good sleeping pad is critical to the success and enjoyment of your camping trip. Without a good sleeping pad, you can lose a lot of sleep and your camping trip can end up being a disaster rather than an enjoyable vacation. Sleeping pads not only keep you comfortable but also keep you warm by insulating your body heat. Before purchasing a sleeping pad, think about what kind of camping you will be doing and what kind of weather you will be camping in. Ultralight sleeping pads make for some of the best backpacking sleeping pads. Of course since the lighter the pad, the more comfort you have to sacrifice, try to balance out what works best for you without weighing yourself down with several extra pounds from a sleeping pad. Be sure to keep our list of the top 10 in mind, since this list is based on sleeping pad reviews from consumers. Overall you want a sleeping pad that is comfortable, durable, insulates heat well, and is easy to set up. It should not be too bulky or heavy. Once you decide which one is the best for you, you will be one step closer to an enjoyable outdoor experience.